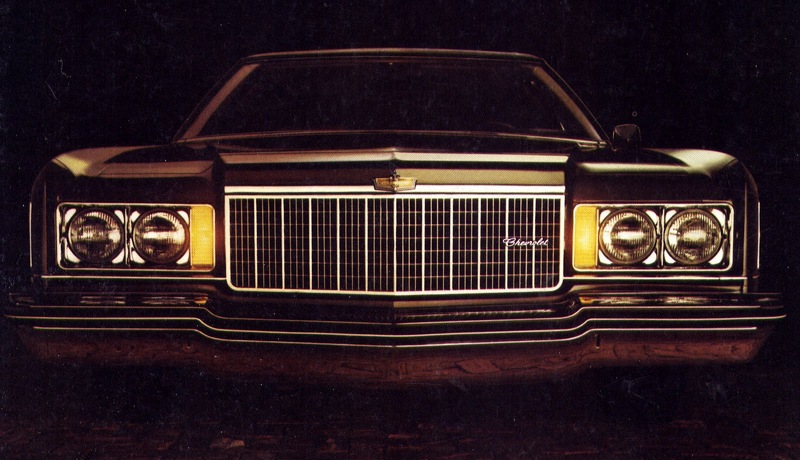 The full-sized 1974 Chevrolet was Canada’s favourite passenger car, selling 49,970 units during the calendar year. Chevrolet has long been popular with the buying public since its introduction to Canadians in 1915. Assembled by the McLaughlin concern in Oshawa, Ontario, the inexpensive Chev complemented the higher-priced McLaughlin and competed head-to-head with Ford. The 1915 Chevrolet Royal Mail. 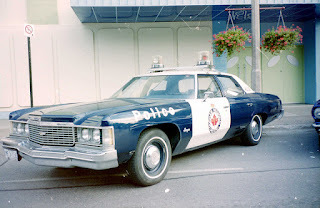 In 1974 Canadians could choose among four full-sized models in the bowtie clan: The top of the line Caprice Classic, the Impala, the Bel Air and a model not available in the United States—a very modestly dressed Biscayne with a V-8 engine. Advertising announced the car with bold words. “A lavish measure of comfort, fine handling and beautiful styling; these are the distinguishing marks of the new Chevrolets.” It further crowed, “there’s much to admire, even more to enjoy in driving the spacious new Chevrolets for 1974.” The wordsmiths had to work their magic to the best of their abilities because even to the untrained eye these cars were virtually unchanged from last year. All of the big Chevs carried 5.7-litre (350-cubic inch) V-8 engines this year and automatic transmissions both features calculated into the base price of the vehicles. The standard equipment V-8 used in Canadian Chevrolets was rated at 185 horsepower--20 more horses than its stateside cousins received. The 18 different models sold domestically were sourced from GM factories in Oshawa, Ontario; Janesville, Wisconsin; St. Louis, Missouri and Wilmington, Delaware. The 1974 Chevrolet Caprice Classic carried its own distinctive rear deck moulding. Triple taillights were long a Chev hallmark. The coupe listed for $4,933 f.o.b. Oshawa. 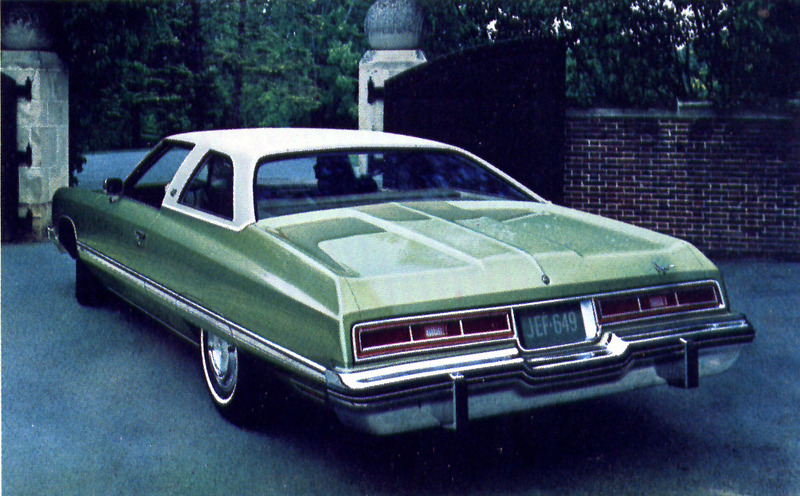 Though the basic envelope looked a great deal like that of 1973, the Caprice Classic was more graceful and distinguished than its relatives, courtesy of a dressier front end and a sculptured deck in the rear. Body styling was crisp with voluptuously finished rectangular lines throughout. This car’s philosophy appealed to those who “think driving is something the car should do.” It was the reasoning behind the exceptional luxury. 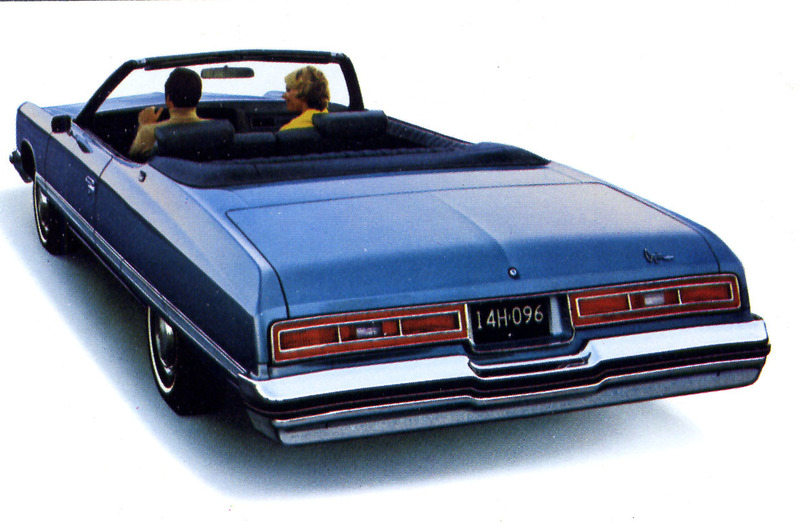 Caprice Classic had a “sure talent for putting pleasure into driving.” A dramatic new Colonnade roof--one with expansive fixed rear glass--appeared on Caprice Classic two-door sedans. With its $4,441 price tag, the 1974 Chevrolet Caprice Classic had the full-sized ragtop field to itself as Ford, Chrysler and American Motors had all withdrawn its convertibles from the market. Interiors of the Caprice Classic boasted a fold-down centre armrest on sedans. The upholstery was a velvet-look plush knit cloth with vinyl inserts in black, blue, green, red or taupe. There were all-vinyl interiors available in black or neutral. Faux wood accents were used sparingly and tastefully throughout the cabin. Doors featured slim, vinyl door pulls. 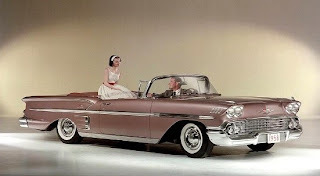 The Impala first bowed in the 1958 model year. Its name evoked glamour and graceful glory then. In 1974 its name had dropped a notch and rode on Chevs that were designated as the marque’s traditional value leader. Impala promised to deliver not only during its years in the driver’s hands but at resale time, too. The 1974 Chevrolet Impala four-door sedan weighed in at 4,338 pounds and carried a $4,506 price tag, f.o.b. Oshawa. The Sport Cloth interiors for Impala were patterned cloth in black, blue, neutral or green with matching nylon cup-pile carpeting. Also there were all-vinyl upholstery schemes in black, neutral, green, blue or saddle. The 1953 Chevrolet Bel Air four-door sedan. The Bel Air name first appeared in 1953 as the top-of-the-line model and 21 years later still graced Chevrolet but this time on a modestly trimmed line of bowties. The 1974 Chevrolet Bel Air. Bel Air’s practical all-vinyl material could be ordered in Green or Neutral for a few bucks extra. The standard interior was a stylish pattern cloth and vinyl in black, neutral or green and still boasted nylon cut-pile carpeting and a colour-keyed steering wheel and column. The 1974 Chevrolet Biscayne was popular with police departments across Canada. The Biscayne was a Canada-only model offered as a plain-Jane four-door sedan and an equally utilitarian four-door station wagon. The former listed for $4,139 and the later carried a $4,894 price tag, f.o.b. Oshawa. Instrument panel for the 1974 full-sized Chevrolet was angular and spare, complimenting the exterior. Chevrolet could be ordered in any of 16 colours—ten of them new this year. To top things off, extra cost vinyl roof covers could be had in black or white plus blue, cream beige, green red, brown russet, saddle or taupe—for two-door coupes and sedans. There were as many options for one’s 1974 Chev as there are kids in the backyard pool on a hot summer’s day. Included among the extras were front bumper guards, steel belted radial tires; an outside remote-control mirror for the right hand side; simulated wire wheel covers; full wheel discs for Impala, Bel Air and Biscayne; “Love” (baby) seats; a plethora of radios and tape players; a new litter container, deluxe seat and shoulder belts; carpeting in black, blue red, gold or russet; a choice of Comfitron or Four-Season air conditioning; 50/50 reclining seats; power seats; power door lock system; power windows, Comfortilt steering wheel; Soft-Ray tinted glass; Cruise-Master speed control; positraction rear axle and a rear-window defogger. If that didn’t complete the shopping list, there was a Quiet Sound Group, designed to give extra insulation for those lesser than Caprice Classic models; superlift rear shocks; trailering equipment; a heavy—duty batter; auxiliary lighting; an electric clock; a dome reading light; door edge guards, a visor vanity mirror; rear bumper guards and rear fender skirts. Sales were off badly for the biggest bowtie. For calendar year 1974 the numbers were 49,970 units delivered, down from 53,225 units delivered in 1973. Despite the low numbers management could heave a collective sigh of relief that Chev was still the number one best selling car in Canada—better than its 1972 finish when Toyota beat out Chevrolet as the nation’s best selling passenger car. 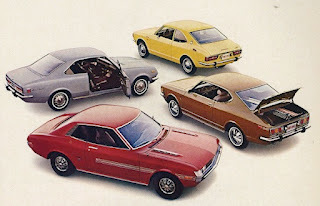 The 1972 Toyota lineup found favour with many Canadians and toppled Chevrolet from its traditional first place in sales.